Does my apple crisp pass the test? If you don’t notice the ground flax seed and toasted wheat germ in the dessert, I don’t have to point it out, right? I made apple crisp for Thanksgiving. I know I’m supposed to be all excited about pumpkin stuff this month, and even made a Pumpkin Spice cake for some friends. But pumpkin’s not my flavor. I prefer gooey chocolate desserts, but since we’d planned a heavy meal I was looking for something lighter. I considered pie, but I don’t like crust. I like filling and topping, though, and apple crisp is just that – filling and topping! Mom’s in for the holiday, and she bakes a mean apple pie so I knew making a healthier version could be a challenge. Because I love the topping so much, I doubled that part of the recipe. The more, the merrier when it comes to the good stuff, I say! 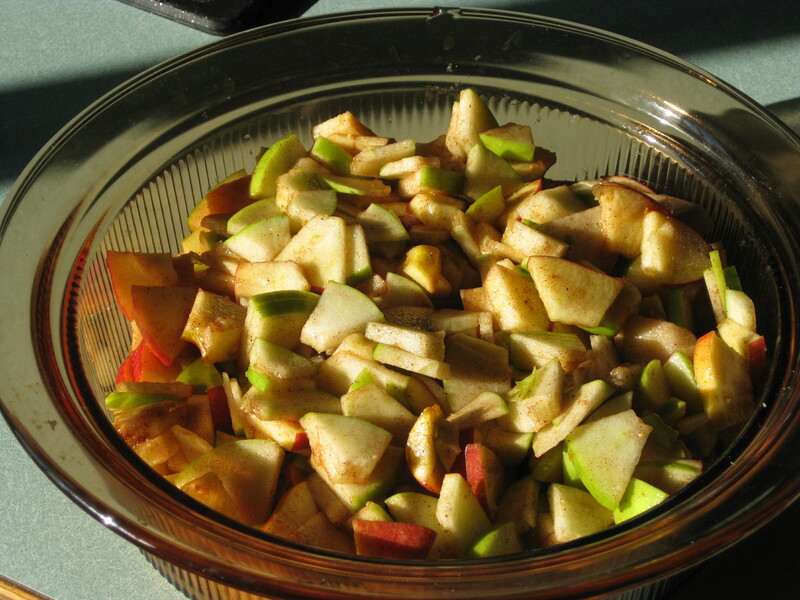 The recipe doesn’t call for any spices mixed with the apples, but I like a lot of flavor so I added plenty of warm spices. Fruit crisp doesn’t require much flour, so I used the recommended amount. I considered switching the white flour for wheat, but crisp topping is dry enough with white flour so I left that alone. Instead of adding all the oatmeal the recipe calls for, I substituted some ground flax seed and toasted wheat germ. Both provide an extra nutritional boost and a nice, nutty flavor. Toasted wheat germ is vitamin- and mineral-rich and high in protein, a good addition to yogurt or many baked goods. Ground flax seed can be a bit grainy, so it’s best used in something that has texture such as a crisp topping or things with oatmeal in them. One of the main components of flax is lignan, which has plant estrogen as well as antioxidants. Did my version pass the test? It looks, smells, tastes and acts like a “normal” crisp. In fact, it’s delicious! Mom liked it, too! Did Mom notice my sneaky ingredients? Nope. Will I tell her? We’ll see!